With topics ranging from private label retail to proper mix ratios, nailsmag.com’s 10 most-viewed questions cover a lot of ground. Some of them date back to 2002 yet still generate daily traffic. It has been fun to see what’s still as relevant as ever more than a decade later. Since the nail industry is forever-changing, however, with the integration of new technology, we wanted to take a second look at our answers. Here, industry experts provide us with updated responses to your popular questions, taking a fresh approach and going deeper into the meat of the issue. Let the countdown begin. 10. What’s the main difference between a classic pedicure and a spa-type pedicure? If you ask 100 pedicurists what the difference between a class pedicure and spa-type pedicure is, the unanimous answer would be pampering. While I believe this is true, I feel the difference is much more significant. A classic spa pedicure is a relatively simple service that cleanses, exfoliates, and polishes toes for well-groomed “pretty feet.” It’s the perfect maintenance service. The spa pedicure takes the service to a new level. While you might see trendy offerings like ice cream pedicures or fish pedicures in magazines or on television, a true spa-pedicure is not only pampering, it’s therapeutic and healing. As you know, the feet are the most neglected part of the body. A spa pedicure incorporates more technical work on toenails, specifically working on ingrown nails, proper shaping and filing, and alleviating problems caused by high heels and pointed toes. Significant time is spent on softening dry, cracked skin, and a massage including reflexology. Reflexology is based on the theory that different internal organs and body parts are connected to the sole of the feet. By incorporating this in your spa pedicure, you’re able to enhance the health of the corresponding organs. In a spa pedicure, you can expect such pampering treatments as a mint mask with feet tucked in warm thermal booties, paraffin treatments, and leg and foot salt and sugar scrubs. A spa pedicure not only leaves feet beautiful and well-groomed, but also helps with such ailments as arthritis, diabetes, and aging. Taking care of your feet is essential to your health and well-being. 9. Is there an easy way to remove a UV gel top coat? Or is there a product for removing this? Some UV gel top coats act just as a hard gel. The only way to remove the hard gel version of UV top coat is to file it off. You can use an electric file or a 100-grit file to achieve the fastest removal time. You’ll want to use the file first to break the seal of the UV gel top coat. To continue to remove the enhancement, you’ll want to soak it off in acetone. Some techs choose to put a few drops of cuticle oil in the acetone during the removal process. Adding cuticle oil can help soften cuticles and prevent some harshness acetone may cause. To remove soak-off UV gel top coat, I recommend using removal wraps. These easy-to-use economical foils feature an absorbent pad. Simply soak the pad in the brand-specific lacquer remover, and then position the pad directly over the nail and wrap the foil around the tip of the nail to hold the pad securely in place. While the nails are soaking, you can warm the hands with salon mitts or terry towels, as warmer nail beds are more conducive to removal. Let the nails rest for 15 minutes, and then gently push off the gel with a cuticle stick. *Be sure to check the instructions or website of the UV top coat you choose to ensure you’re getting the best removal in the least amount of time. 8. 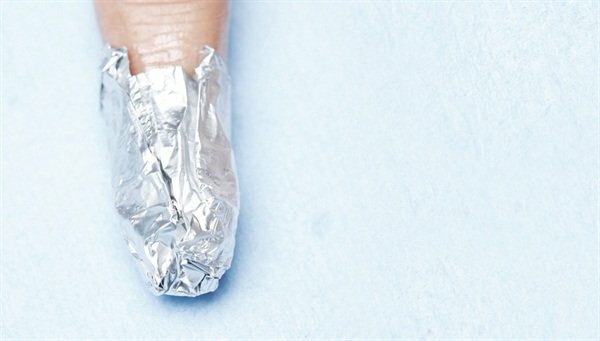 Can UV nail dryers dry polish without a UV top coat? You don’t want to dry regular polish with a UV lamp — there’s no benefit because it’s not for drying; it’s a specific tool used for curing. Curing means you’re starting a chemical reaction that causes the gel to harden. In this chemical reaction, the UV light makes the monomers and oligomers in the gel-polish link up into polymers. The polymer network holds the color and shimmer particles in place. Conventional polish hardens by drying of the solvents, not curing — the polymers are already made, so there’s nothing for the UV lamp to cure. When you put regular polish in a UV lamp, it’s just the heat that might make your dry time seem faster. In that case, if you must speed up dry time, just order a heat lamp. If a UV nail dryer is strictly putting out light, then the only purpose it would serve for a non-UV top coat is to get the client to sit still and waste bulb life. The UV light reacts with something in a UV top coat like a photo-initiator, which then polymerizes or hardens. A non-UV top coat will be drying using the evaporation of solvents, which is not affected by the UV light. If a UV dryer has forced air, it can slightly aid in the dry time; however, the most efficient acceleration for a non UV top coat is using a product specially made for polish drying. 7. What would cause a toenail to turn brown? My client says she hasn’t dropped anything on her toenail, but she admits that she picked the nail off at one point and it grew back brown. Most Common: Trauma, which leads to hemorrhage under the nail. The blood from the hemorrhage can look purple, red, black, and/or brown. Trauma can be from an object falling on the toe, stubbing the toe, or even an overly aggressive manicure or manually picking at the nail harshly. Also possible: A bacterial or fungal proliferation, usually in the setting of a toenail that is already infected with fungus. Many bacteria and fungi are capable of producing pigment, most often brown, but also green or black. This is not an uncommon condition, and can be treated. Least common: Tumor. Several benign and malignant tumors are capable of causing hemorrhage, causing the nail to turn brown. The most common benign growth capable of doing this is a wart. However, malignant tumors, such as squamous cell carcinoma and malignant melanoma are capable of stimulating hemorrhage as well. Malignant melanoma can product a brown pigment in the nail. 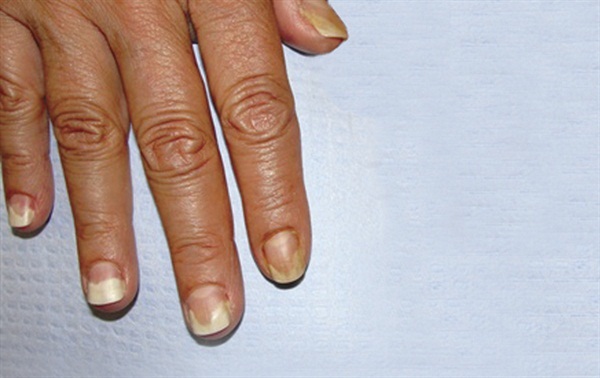 For these reasons, the new onset of pigment in the nail should never be ignored. I always recommend having pigment in the nail evaluated by a physician, preferably a dermatologist, to rule out malignancy or initiate treatment for infection. 6. If I’m mixing glitter into my acrylic powder, what is the ratio I should use? Can I dip my wet ball into the glitter? The glitter to acrylic powder ratio should be 1:20. I’ve established this ratio based on a few experiments I’ve conducted. If too much glitter is added, then the acrylic won’t be strong enough when it’s cured. More glitter can be added and the acrylic will still cure, but the consistency of the acrylic ball changes and the cured product becomes weaker. I think some techs would argue that they use more glitter than the 1:20 ratio and some would argue that 1:20 is too much. Everyone has their own opinions and the 1:20 ratio is my opinion. 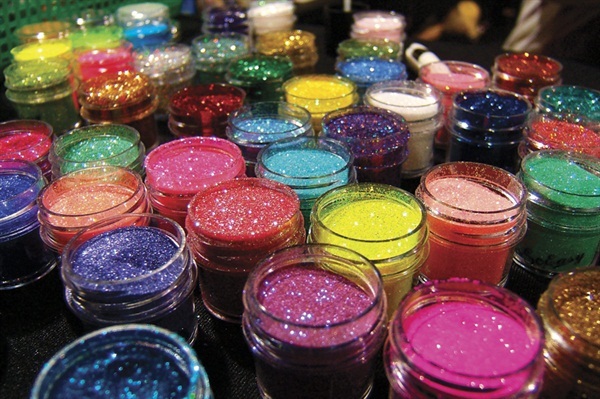 I would pre-mix the acrylic powder and glitter together in a mixing container. Dipping a wet ball into glitter will inhibit proper adhesion to the nail and the glitter on the nail side of the acrylic ball will be a problem. The tech would be more successful if she put an acrylic ball on the nail, gave it the proper shape, and then dipped the brush into some dry glitter, patting it into place on the top of the acrylic that was just applied to the nail. 5. What’s the best way to keep rhinestones on the nail so they won’t fall off as easily? Apply crystals directly onto an uncured layer of soak-off gel top coat. After it has cured, place small drops between each stone and cap around the edges, creating invisible “prongs” out of the gel. For better strength and adhesion, I recommend using a soak-off gel that’s 100% gel rather than a hybrid. Don’t cover the entire crystal with gel because that will take away from the cut of the stone and the stone will lose its brilliance and sparkle. Make sure you’re applying enough gel to hold it. If you’re just running a brush around the stone, you’ll probably wipe most of it off at the same time. Be aware of how much you are actually applying. I usually do this two to three times on people who are very rough with their hands. You can never really guarantee how long it will last — it’s up to the client to treat their nails like jewels, not tools! For larger stones, you may want to glue them down with a resin first. I don’t typically do this but other people have success with it. Glue really isn’t recommended for crystals though because it eats away at the foil backing of the crystal and if any glue touches the surface of the stone, it will give it a cloudy appearance. Glue will also cause damage to the foil backing during removal. Gel, however, won’t damage the foil backing on the crystals, allowing your customers to keep them for another design in the future. (They get their money’s worth!) Soaking in acetone-based solution will loosen/soften the gel without leaving a sticky residue on the crystals so they can be reapplied. 4. One of my clients has dry white spots on her big toenails. She went to the podiatrist and he said she was allergic to nail polish. I would put oil on and buff and the white spots would go away. I have seen this on almost every client at one time or another, especially in the winter. What do you think it is? — Torie Bastian, CND education ambassador and owner of The Polish Pinky in Crown Point, Ind. As a nail tech, making a diagnosis is beyond the scope of our license. However, we all see this issue in the salon. It could be fungus and should be diagnosed and treated by a podiatrist. If it’s confirmed to be fungus, suggest your client use a professional product, tea tree oil, or Vicks VapoRub as an over-the-counter remedy. You might be seeing more of this in the winter because the client is wearing closed-toe rather than opentoe shoes. Educate your clients and tell them shoes take three days to dry out so they should wear different shoes every day. Also, real cotton socks help with the moisture in the shoes. — Vicki Peters, independent master nail technician and educator, and owner of Polish Salon in Brea, Calif.
3. 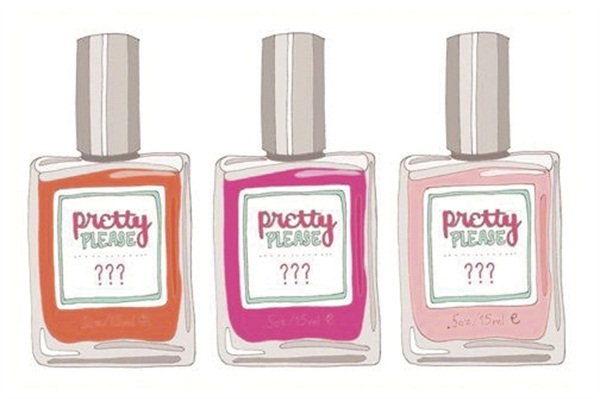 How do I create my own custom nail polish line or find a manufacturer that helps with polish design and branding? There are some companies out there that will sell private label bulk for you to create your own polish line. The best way to get started is to work with one of these middle man manufacturers. They tend to offer you a price for ordering smaller quantities, which is great for someone just starting out in private label. Generally, they can provide a generic bottle and cap that you can either screen or print a label for. Once the line becomes a high seller, you’ll want to get to know all the players and take your business direct to bring your costs down. That tends to be a bit more of a “club” of knowledge, meaning manufacturers aren’t quick to give away their sources. 2. What’s the best way to clean my acrylic brush? As a nail professional, the tools we use are very important to our success behind the table. Our brush is one of our most important tools and should be handled with “TLC” (tender loving care). Your brush should be cleaned properly after every use, according to the manufacturer’s instructions. You should only use a brush cleaner if the manufacturer of your brush makes one. Additionally, don’t clean your brush with acetone as this can be drying to the hairs and contaminate your product. 1. Clean the brush with liquid (monomer) after each use. 2. Wipe the brush clean on a lint-free nail wipe. If needed, gently use an orangewood stick to remove residual acrylic in the brush. 3. Store your brush flat in a brush case or cut the end of an eye dropper and use the large side to store the brush’s tip. When you store your brush upside down or hang it in your lamp, it causes contamination of your liquid with every use. The yellow that you see when you wipe your brush is caused by contamination. Of course, contamination leads to service breakdown (yellowing, lifting, etc.). If you’re good to your brush, your brush will be good to you. The best way to care for your brush is to be diligent in cleaning it with monomer directly after using it. Wiping the brush on an absorbent paper towel is the other secret. Bounty or Viva are two good brands that have enough texture and absorbency to clean a brush. Blue auto shop towels also work great. Cleaning your brush with acetone is very harsh and drying to the hairs. Acetone will eventually strip the natural coating of the hair causing acrylic to stick to it. If you do happen to get dried acrylic in your brush, here is what you should do: In a small glass dish, soak the dried part of the bristles for a minute or so. Do not leave it sitting in there, as the bristles will bend. Then gently work the product out using an orangewood stick on a paper towel. Repeat this until all the product is dissolved and worked out. Using a paper towel will help remove all excess acetone. After, recondition the brush in monomer, and roll it on a paper towel to remove the excess and hang bristles down to dry. 1. I injured my nail causing it to lift from the nail bed. It’s been about two months and the nail is growing, but it is not reattaching. It’s lifted down to the cuticle. I feel only a little pain if I hit or squeeze the nail hard. Is the nail damaged for good? Should I cut it back? Will I be able to apply a tip in the future? You are describing trauma-induced onycholysis (separation of the nail plate from the underlying nail bed). If the matrix (the portion of the nail under the cuticle) was severely damaged, then it is possible that the injury will result in a permanent alteration or, in your case, permanent separation because unfortunately the matrix doesn’t repair itself well. However, the good news is that two months is not a long enough time to assess whether there has been permanent damage. 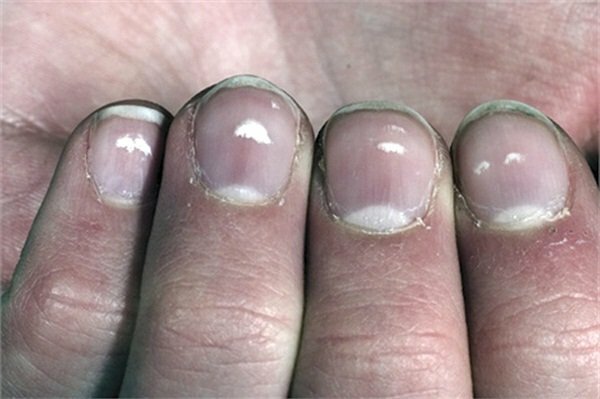 It will take six months to completely replace the average fingernail and given that you can already see growth, it will likely be closer to four months in this case. Let the nail grow and don’t file it as it is growing, as this will put excessive pressure on the portion that is attached, potentially causing further separation. Keep the nail as dry as possible by wearing gloves with any wet work and avoid covering the nail with a bandage. Avoid all nail cosmetics during this healing period as exposure to polish remover will prevent the nail from re-adhering to the nail bed. To see the original answers and more useful FAQs, you can visit www.nailsmag.com/qa/list.